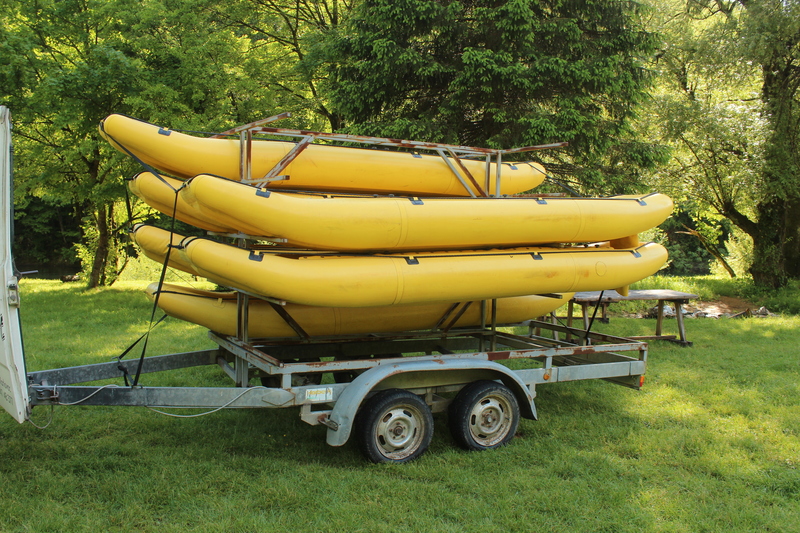 Another day, another test – a 2-hour kayak tour of the Mreznica River in rubber canoes. I had a feeling it was not going to be a gentle trip down a calm river! 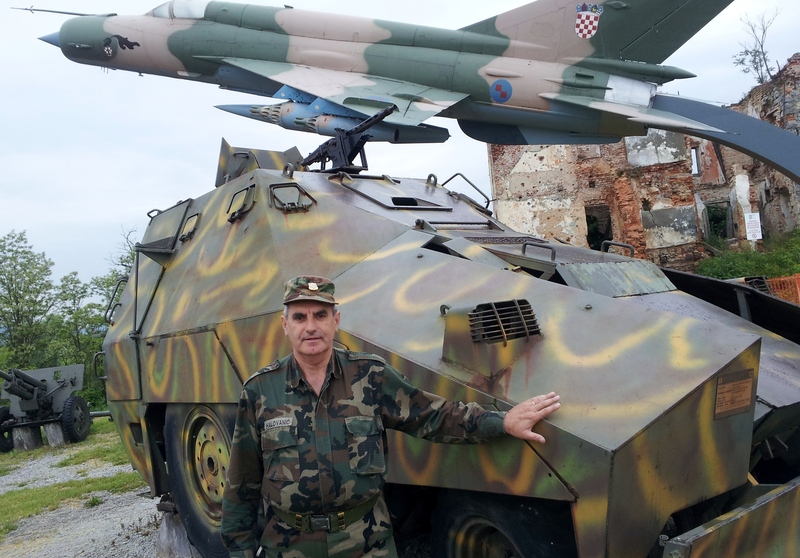 We met our guide, Mario, at the Museum of Croatian Independence War, an outdoor collection of WW2 tanks and guns and more recent “tanks” fashioned from tractors and vans during the Croatian war of independence from 1990 to 1995. He introduced us to a former Yugoslav colonel in full camouflage fatigues — a fine beer belly hanging over his belt. I still haven’t a clue what happened, but the phrase Serbian oppression came up several times. Karlovac, where we stopped, was apparently ground zero, and the site was surrounded by the remains of brick houses. As we drove through the area, bullet holes were still visible in the stone facades. There were also photos of a gorgeous modern museum the locals hope to build one day – though at the rate donations are coming in it may take awhile. The best part was a basket of dense brown bread made by a villager from grains milled in the village. The crust was gritty with cornmeal. It arrived with little triangles of smoked cheese and goat cheese. 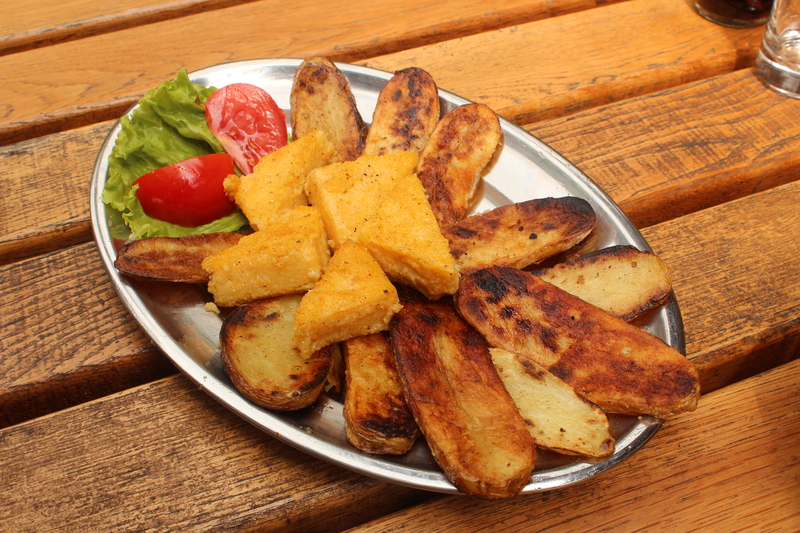 Then came the hot food – a plate of fried polenta triangles and thin oval slices of grilled potatoes, another local specialty. Oh, if only every potato had this much flavour. As we drove toward the river, the rain began. Not enough to take seriously, but it wasn’t quite the hot sunny day we’d hoped for. Mario’s team was waiting with the boats. They handed us neoprene wetsuits to put on in the van – it was like putting on a thick, heavy bodysuit – followed by neoprene socks, to go under my brand new water shoes. We had to leave the warmth of the car to put on helmets and waterproof jackets. A woman on the team strapped me into my life jacket. Can you breathe? she asked, pulling the straps tight. We could hear the roar of rapids below us. It was now or never! First step, dragging the long heavy rubber canoes down a rocky hill to the water’s edge. I’m not sure why the strapping young guys didn’t do this while waiting for us, but I suppose it’s all part of the Experience. By now it was pouring rain, but since we were about to get wet, it really didn’t matter anymore. The boys slid the canoes in the water and we slid down the side of the waterfall to get into them. I was paired with a cute young guy named Gelvik or some such – honestly this language! As we started down the river, me at the front doing my best imitation of paddling and G at the back, steering, it began to thunder. Surely not a good sign. About 5 minutes later we made our first stop, just before a bigger waterfall. One by one, they asked us to walk in the water, holding onto the rock when necessary to avoid being swept into the current, to a point overlooking the falls. Which we did, feeling each stone with our shoes before taking a step. When we all reached the lookout point, the conversation began in earnest. Stay or go? Even Mario admitted it wasn’t wise to paddle down a river with metal paddles, soaking wet, in the middle of a thunderstorm. The sky was leaden and the rain showed no sign of letting up. Though I hated the thought of giving up after we’d driven all the way there and gone to the trouble of suiting up, (and I still have to produce an Adventure Travel story!) I was rather relieved when Mia, who’s responsible for our safety, agreed that we should turn back. Jayne, Cheryl and I, immediately complied, feeling our way once more through the water until we reached the beached canoes. But things had changed again. Apparently the two intrepid New Yorkers, one an ultra-elite athlete, decided they weren’t going to let a little rain stop them, and insisted on continuing. Mia had to go with them, and Mario left us with Bruno, who was charged with taking us to a nearby farmhouse where we could wait for the others to finish. As we reached the top of the hill, we realized our secret fantasy of retrieving warm, dry clothes from the van was not to be. The van was gone! We had no choice but to trudge up the hill in our wetsuits. By then the rain had slowed and it actually looked brighter, making us feel even more like wimps. The howling of nine big furry dogs greeted us at the farmhouse. Fortunately the owners, Anita and Branko, speak English well and know Mario’s crew, and they immediately welcomed us into their old one-room stone house, not much bigger than a garage. They’d turned it into a kitchen, dining area with picnic area and sitting room, where we sat in front of an upright oil drum turned into a wood stove to warm up. Anita said they own a bigger house in the village but they prefer living here, closer to their sheep, cows and horses. And dogs. She made tea in a big saucepan, and Branko, tall and handsome with bright wild eyes, urged us to add a shot of home-made brandy from brown beer bottles. We declined. Since we were probably their only visitors that day, and North Americans to boot, Branko launched into his thoughts on global warning (rubbish, he says, it’s all to do with the magnetic pole changing) and used old American movies we’d never heard of starring Bruce Willis and Al Pacino, to advance his conspiracy theories. Jayne and I let Cam talk to him, while we chatted with Anita, who has a sister in Ohio, and petted her two “inside” dogs as the storm raged outside, with more thunder and lashing rain. Two hours later – I had no clue what time it was since I’d left my watch in the van – our saviours arrived with the van. By the time we met the others, freezing cold but exhilarated by their trip, we were dressed and feeling human again. It was now 4 p.m. and time for lunch! 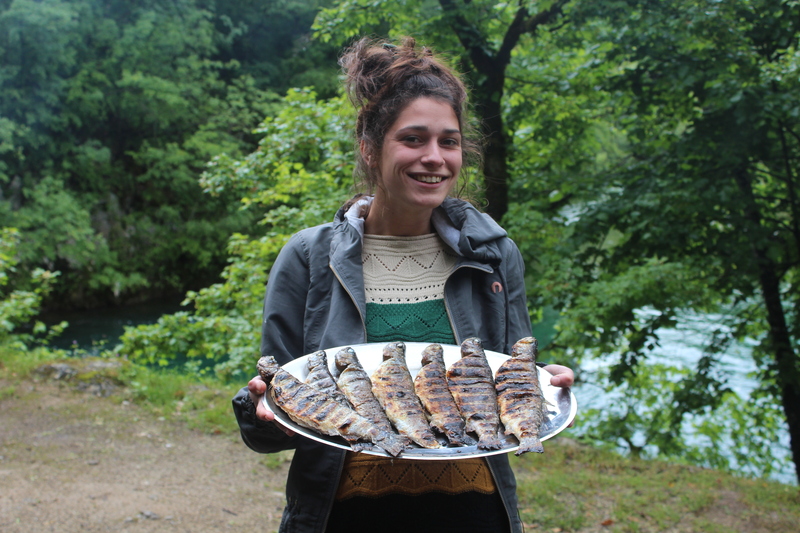 By the time we drove to the hut where a group of hippie kids was grilling fresh whole trout for us, the weather had changed again. Blue skies with warm, bright sunshine. Aargh! We started with homemade bread and two dips, a trout pate and foraged wild leek pesto. They served the trout with roast potatoes, cabbage slaw and zucchini salad. Four hours later we were dining again, this time at our new hotel. T. C. Marko. Another feast, this one a platter of spit-roasted lamb cut into chunks with more great potatoes and bread and a delicious soup flecked with bits of lamb liver. After a few beers, Mario just happened to mention that our new friend Branko was a former mafia boss, one reason why he lived in such an isolated place. We asked for details but he wouldn’t say anymore, perhaps fearing he might get his legs broken? We went to bed at midnight in our frigid rooms, exhausted but not hungry. Great to read your adventures. Look forward to your next posts. what an amazing adventure…..you go girl! Wow – I am impressed and inspired by your enthusiasm for all these adventures! Can’t wait for the next installment! enjoy!